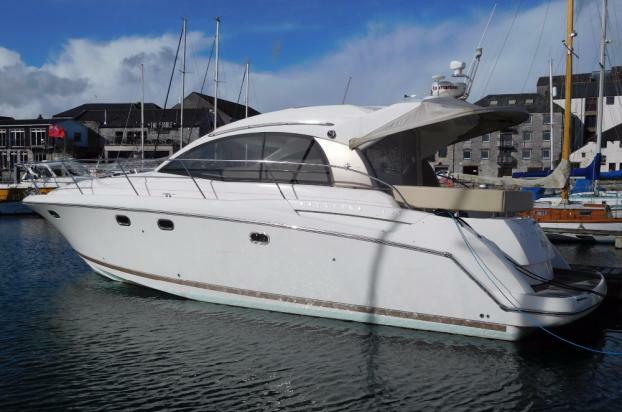 The Prestige 38s is a very versatile boat, ideal for long or short range cruising whether as a couple or a family. It is an ideal boat for socializing with a large cockpit and bow sunpad area. sink, Corian work surfaces, ample cupboards and drawers. lockers, en-suite access to heads compartment. Heads compartment: with sea toilet, vanity unit with sink, shower and ample storage. Doors to both forward cabin and saloon. vanity unit, hanging locker and television. Cockpit Area: Spacious cockpit with two separate seating areas which can be separated with a removable back cover to create a wheelhouse or a large open plan area. Aft seating area with adjacent access to the large bathing platform, 'U' shaped seating with sun shade over, cockpit cushions & table. Infill cushions to create a large aft sun pad. Wet bar aft of helm position with Ono BBQ style hotplate, sink, fridge and ample stowage. The deep vee hull offers speedy performance. The cockpit benefits from a hardtop with large electric sunroof, transom gate to bathing platform with integral ladder. Seating area of cockpit lifts hydraulically to give access to the tender garage. Wet bar to starboard side of cockpit with sink and fridge. Cockpit seating can be converted to large sun pad with mattress, there is a hot and cold cockpit shower and full cockpit canopy, and the foredeck has a large sunbathing area.